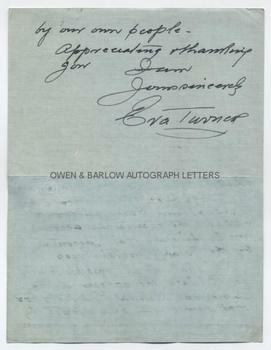 EVA TURNER autograph Letter Signed. Dame Eva Turner. British (English) soprano singer. ALS. 2pp. Hotel Metropole, London, WC2. 27th July 1928. To [Richard] Capell, the noted and influential music critic on the Daily Mail (and later, the Daily Telegraph). 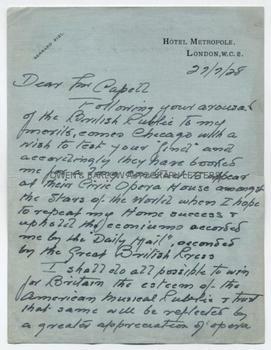 "Following your arousal of the British Public to my merits, comes Chicago with a wish to test your "find" and accordingly they have booked me for a long contract to appear at their Civic Opera House among the Stars of the World when I hope to repeat my House success and uphold the enconiums accorded me by the 'Daily Mail', seconded by the Great British Press. I shall do all possible to win for Britain the esteem of the American Musical Public and trust that same will be reflected by a greater appreciation of opera by our own people. Appreciating and thanking you, I am yours sincerely, Eva Turner". 4to. Approx 8 x 6 inches (20 x 15 cms). In fine condition. A nice letter written by the still young Eva Turner at the beginning of her career. In 1924 Eva Turner had auditioned for the La Scala Company, where she had impressed its principal conductor Arturo Toscanini who had engaged her to perform in the La Scala Ring Cycle of 1924-25. She appeared in the title role of Turandot in December 1926 and repeated the performance to critical acclaim at Covent Garden in 1928 and, in the same year, also took the roles of Aida and Santuzza. Richard Capell of the Daily Mail had been one of her earliest champions in Britain and it is clear from this letter that Eva Turner credited him in no small way with her emerging success. Eva Turner made her American debut as Aida with the Chicago Opera in 1928 and, in accordance with the wish expressed in this letter, she did, indeed, make an immediate impact on the American public. Her Turandot set the standard by which all others have since been judged.